While plants are spiking or budding they should not be under any stress otherwise the first thing they will likely do is abort the buds. So, I make sure that my orchids stay moist and do not dry out when they are in bud. Also while some oncidiums like a good drying out in nature, I find that in the home, where humidity is lower you need to compensate by not letting them dry out quite as much. I purchased an Oncidium Sweet Ears two weeks ago. It already had a flower spike with buds. It required repotting and I did so in a clay pot with slits. (Usually I do not repot an orchid that has a flower spike.) I did this so that the potting medium would dry faster, knowing that Oncidiums like a dry period before watering again. The plant is in a makeshift greenhouse (in the basement) with 7 other orchids all of which are getting plenty of light from a T5 fixture/fluorescent bulb for plants. The greenhouse contains two water trays at both ends and a fan for air circulation. Although the buds on the Oncidium spike have become larger within the last 2 weeks, they have not unfolded and so I am concerned about this. I think Sweet Ears are supposed to be watered more when the plant is not in the process of flowering; and if the firm pseudobulbs are plump I understand it’s better not to overwater the plant. But because it is in a clay pot I wonder if I should water it more often because the medium would be drying out faster. (I’m not fertilizing while there is a spike.) Anyway, the buds are not opening and I’m wondering what I need to do get them to open! – David E.
Hi Carlos, I think you may be right in that it is a tetraploid. I checked the patent online but it doesn’t say anything about that. I agree, this is a great hybrid..! Indeed! 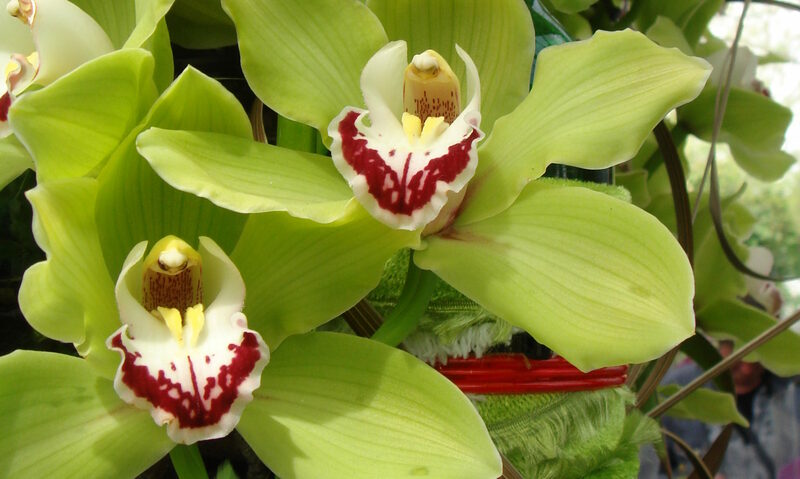 It is an amazing hybrid with gorgeous flowers! Most likely it’s a tetraploid. I bought one small plant in San Francisco, Calif. At the plaza of the BART station at 24th st/ Mission st. Very inexpensive for the quality one gets! A real jewel I treasure to own. It has a panicle already full of flowers (and more coming), as well as another baby panicle coming from another pseudobulb, which means I’m gonna be seeing these flowers for as long as (probably) November! (today it’s 8/10/2010). I only regret I didn’t buy three or four of these beauties! I cross my fingers the lady at the stand where I bought them will be there again this saturday. Excuse my enthusiasm, I’ve had lots of Onc. varicosum hybrids in the past, but never a cross of this precious quality, a real jewel! Carlos O.